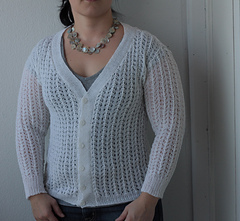 > Lace Cardigan in Eyelet Pattern aka "Eyelet Cardy"
Lace Cardigan in Eyelet Pattern aka "Eyelet Cardy"
Yarn information entered from Country Weekend Knits. Next row Patt 8, sl next 21 st onto a stitch holder, patt across sts of first pocket lining, patt to last 29 sts, sl next 21 st onto a stitch holder, patt across sts of second pocket lining, patt to end. “A Traditional Shetland Eyelet pattern worked in 2ply lace wool makes a gossamer-fine openwork cardigan suitable for summer or evening wear”.